How To Add A New User to my account? 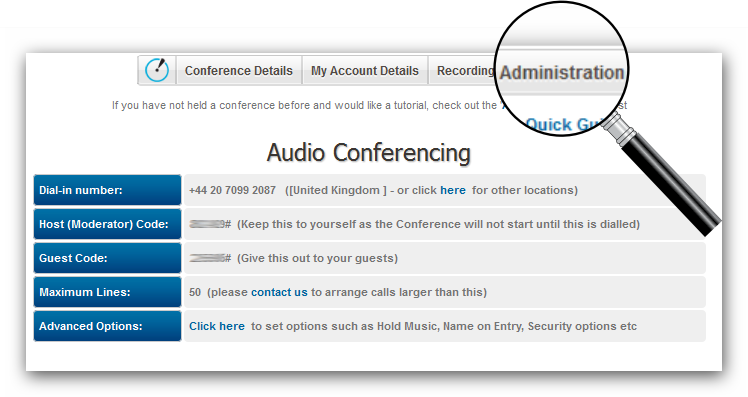 If you are the administrator of your company’s 247meeting account you will be able to log into MyAdmin and quickly add new users. There is no cost for adding additional users on your account and avoiding shared user accounts will reap benefits for security and transparent invoicing. If you are not the administrator on the account, please feel free to contact us directly to assist you with setting up new user accounts. You can reach us by phone, email, or our chat service – during office hours. Step 1: Once you’ve successfully logged in you will be redirected to the MyAdmin landing page. If you’re the administrator for the account you will see an ‘Administration’ tab. Select this tab to add new users to your account. Step 2: On the Administration page you will see a list of available functions you can use to manage your account. The second option will be to ‘Add new user’. Expand this option in the list to begin filling in your user’s details. The first option on the form to be selected is to whom you would like the welcome email, containing Host, Guest Codes and Dial-In Number, sent to. ‘Send email only to yourself’ will send the details to the email address you used to log in. ‘Send email only to the new user created’ will send the details to the email address you enter for the new user in this form. ‘Send email to both yourself and the new user created’ will send an email to both these email addresses. ‘Send no email’ will not send the details to any email address and the user will have to wait for their wallet card to arrive by post, or log into their personal Control Panel, in order to retrieve these details and use their account. If you would like to give this user administrative rights, please ensure to check the tick box ‘Administrative Contact’ at the end of the form. Once you’re happy that the form is filled and correct, hit ‘Save’ and your new user will be created and their details ready to use.